It’s great to see where our blinds end up, and when these pictures came through we just had to share them with you! This domestic installation in Essex required YewdaleDefiant® R55 heavy duty electric roller blinds for two bi-fold doors. They used three blinds for one set of doors and the other with two blinds, which is a substantial weight on the barrels of the blinds. The R55 was selected because it wouldn’t sag in the middle under the weight and still function smoothly. They opted for screen fabric to take the glare out of the direct sunlight that regularly streams into the room, particular the low winter sun, whilst maintaining a pleasant level of natural light. The fabric also provides privacy which is always a welcome addition with floor-to-ceiling bi-fold glass doors. Despite being commonly used in industrial settings, it is clear that the R55 can comfortably blend into the room – the hard-working mechanisms are all tucked away within the barrel, leaving a sleek and stylish blind visible in the room. 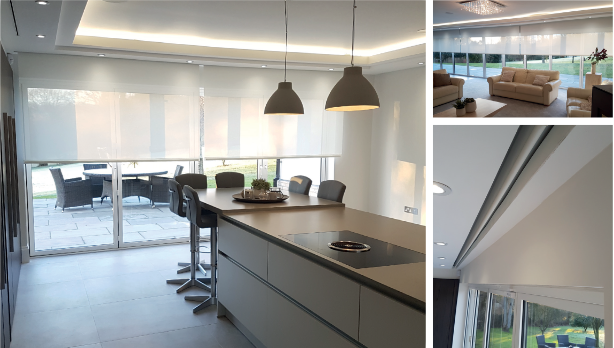 Sitting comfortably within this homely and modern setting, the YewdaleDefiant® R55 electric roller blind provides a seamless transition between the garden and living space. It allows the homeowners to enjoy the outside view or close out the world at the touch of a button. The YewdaleDefiant® R55 can have a 53mm or 70mm grooved aluminium barrel, the size of which is dependent on the fabric weight. It comes with a 240v AC Yewdale motor and can be controlled by a switch on the wall or remote control. Interestingly, this system can join a group control system, where blinds can be individually raised or lowered, or all blinds can be raised and lowered simultaneously. As you can see from the images above, Yewdale systems can be easily installed into a domestic setting as they can in a corporate or industrial environment. Installed your system R40 roller yesterday; absolute delight to install and operate. Thank you and Mike for the prompt delivery and superb system.